Bird Alert: Who’s Nesting and Who’s Heading North? 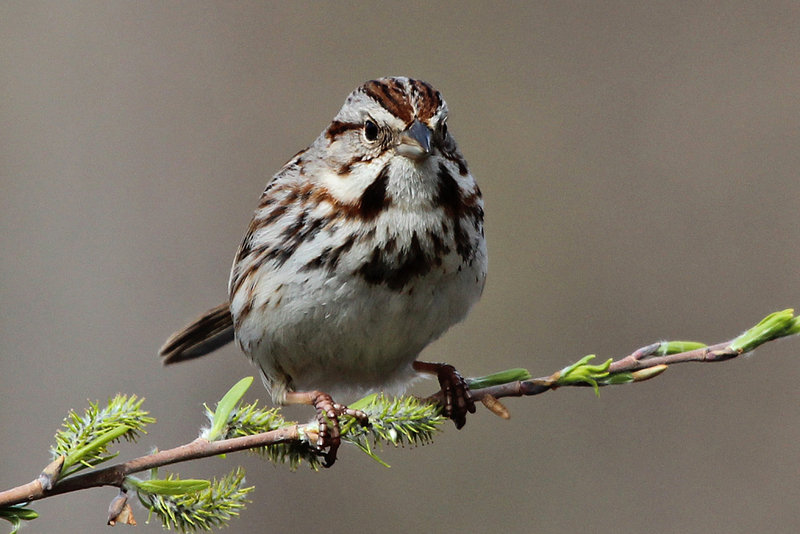 Song Sparrows should be singing around our place – males marking their territories. The name is apt. While the basic song can be interpreted as "maids, maids, maids, put on your tea kettle-ettle-ettle," birds will sing up to 20 different melodies with many improvised variations, but the average male in his territory will sing 8-12 songs. Apparently, the more songs he has, the fitter he is as a mate. Males in nearby, established territories can recognize each other (low threat) and any aggressive intruders (high threat). Males on good terms will sing very similar songs, helping them fit into the neighbourhood, while aggressive males will sing contrasting songs. Birds in noisy urban areas will alter the pitch of their songs (generally fewer low tones) to make them stand out from the background. These birds are everywhere, from the city to the suburbs to rural areas, absent only in deep forests. They are fairly easy to identify, with a light stripe over the eye and a small, dark patch on their breast, but not always easy to see. Their earth tone stripes match their environment well. 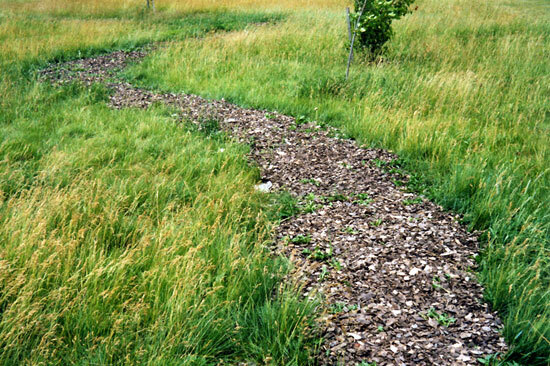 They are ground feeders that like shrubby thickets and tall grasses, and can often be found on the margins of developed areas. Letting a corner of the schoolyard go unmowed will improve your chances of having Song Sparrows right at hand. They also nest on or near the ground, so cover is important. The birds maintain their small (0.2 – 0.6 ha) territories even after mating and raising young, and remain quite vocal about it. Their alarm call is quite distinctive, and they will noisily track predators and other intruders. They don’t, however, like to be seen, and will often run along the ground rather than fly when you approach. But if you sit still, or move slowly and quietly, you will have a better chance of seeing them flit around and sing, particularly if they are in territorial mode. They are also cooperative, feeding in conjunction with their mate, a brood mate or offspring, and will maintain contact with companion calls (“jep”) and displays. Song Sparrows are scratch feeders, eating a wide range of invertebrates and seeds. Don’t put away the snow shovel yet. A big snowstorm is less unusual for April than one might think. Montreal, for example, averages 13 cm of snow for the month. Find out how much snow you generally get in April by clicking on the nearest city. 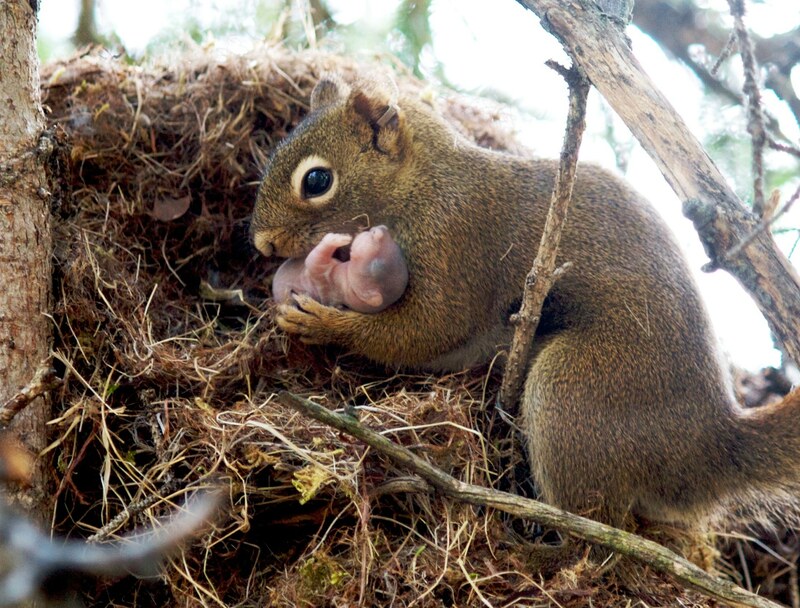 Red Squirrels are giving birth, using dreys, nest boxes and tree cavities. Red Squirrel dreys are smaller than those of Gray Squirrels, and often made of grass, not leaves. The first bats will begin to fly on mild evenings. These are our hibernators (e.g. Big and Little Brown Bats ), not our migrators (e.g. Red and Hoary Bats). Females will soon move to nursery sites. Yellow-bellied Sapsuckers are arriving, and they and other woodpecker males and females will be drumming to establish territory and attract mates. The ‘drum roll’ tat-tat-tating is just a little different for each species, and has nothing to do with finding food. Perhaps you will be lucky enough to hear one at 5:30 a.m., drumming on your aluminum downspout. 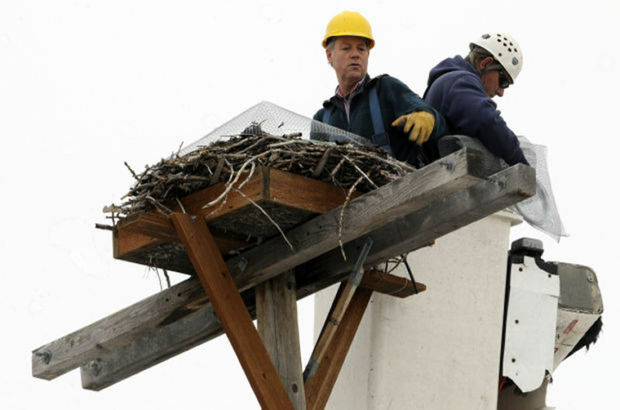 Osprey, Common Grackles and American Robins may be already nesting. And you won’t hear those raucous Blue Jays, because they’re nesting, too, and don’t want to advertise their locations. An increasing number of Sandhill Cranes are also nesting in south-central Ontario, but some are on their way further north and will breed across much of Canada west of the Maritimes. 80% of the world’s Sandhill population can be found resting and refueling on Nebraska’s Platte River in early April before continuing north through Western Canada. Warblers are moving through, including Pine and Yellow-rumped, along with Ruby-crowned Kinglets and Hermit Thrushes. Dark-eyed Juncos that have overwintered, along with those from further south, are moving north, along with a number of water birds where lakes and rivers are open or opening, including: Snow Geese, Northern Pintails, Greater Scaup and Canvasbacks. Migrating Tree Swallows are probably, or soon will be, at their peak abundance, many destined for northern regions. Canada Geese should be laying their eggs. 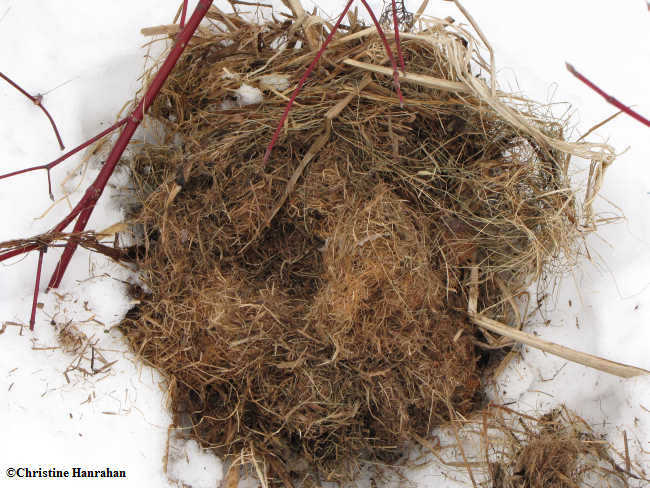 So check out wetland and water margins for the activities of these early spring nesters. At times, they will take over Osprey nests, and these may have to be screened until the Osprey arrive. Both yearling Beavers and Muskrats are forced from their natal homes and habitat, wandering broadly in search of new territory. This helps limit the density of these animals across the landscape, and fills in any areas (if any!) lacking in these enterprising, giant rodents. Watch out for them along roads near wetlands. 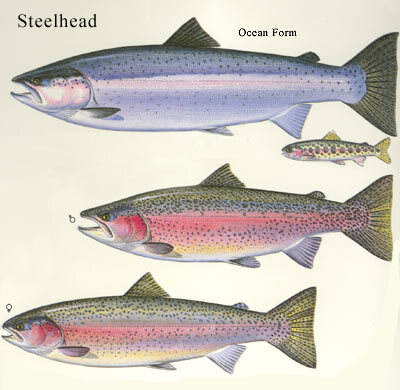 Rainbow Trout, in their ‘Steelhead’ form, are moving out of the Great Lakes and into the shallow, rocky portions of streams in preparation for spawning. They will jump over low dams (the first one makes it at about 1:35) and up fish ladders. Local anglers should know the best spots for viewing. Well worth a short field trip. 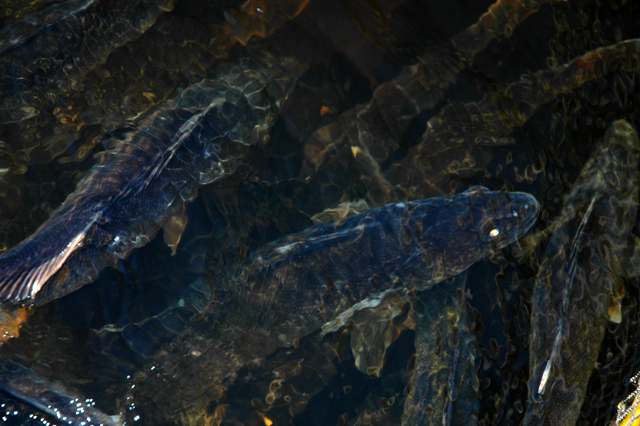 Walleye are spawning, either in fast-moving streams over gravel and rocks, or over rocky shoals in lakes, beginning when the water temperature reaches 70C. Spawning takes place mostly at night, and you can see the shine of the fishes’ eyes in the beam of a strong flashlight. 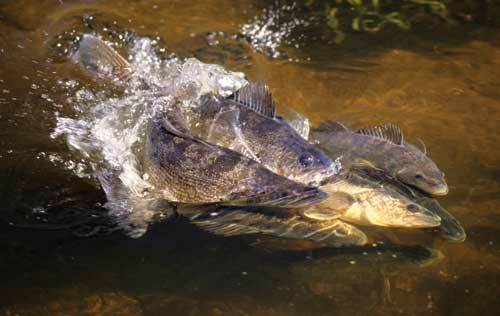 Trout-perch spawn closer to shore in lakes, and White Suckers will spawn with Walleye in streams. Green shoots may be appearing, and buds are swelling. 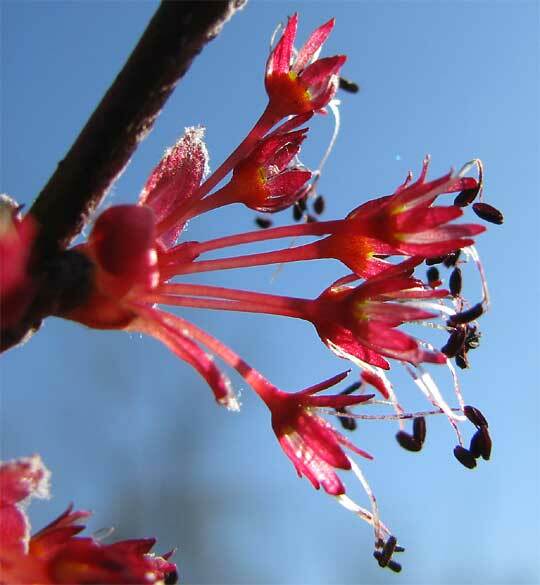 In addition to the catkins of late March, look for Red Maple and American Elm flowers (scroll down). Venus and Mercury will share the morning sky to the east and will be closest together on the morning of the 16th. They may be seen within a single binocular field. The best celestial event, however, may be the Lyrid meteor shower, which peaks before dawn on April 23rd, with some meteors visible from the 16th to the 25th. Up to 10-20 meteors can be seen per hour (up to 100 in uncommon surges). The meteors will fly out in all directions from a point above and to the right of Lyra in the northeast sky as the earth passes through cometary debris. If the weather’s bad, the night/morning before and after the 23rd should still hold significant meteors. Unfortunately, moonlight will dampen viewing.